On May 25, 2010, I published my first blog post ever! I had never had an online space before and had no idea what I was doing, but here we are five years later. Hurrah! I'd even say I'm having more fun than ever. 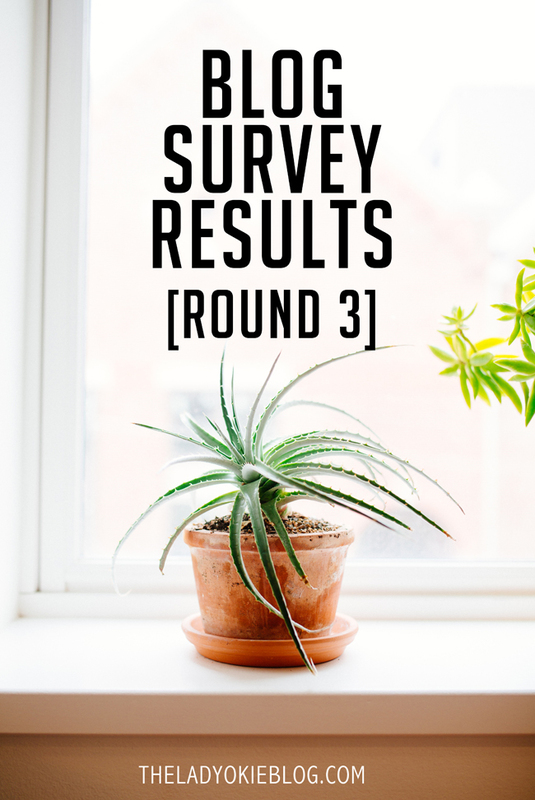 Last month I conducted my third reader survey, and as usual it was really fun to go through all the answers. I got a total of 192 responses! I was hoping for an even 200, but WHATEVER, YOU GUYS. It's fine. I'm over it. Before we start, I say this every time I do a blog survey, but I just want everyone to take a moment of silence for all the moments I spent making these pie charts that I can never get back. The US seems to dominate my blogging world, but I have enjoyed getting to know some of you who hail from foreign lands I'll probably never get to visit. I asked this question in my first reader survey, and the percentages were about the same. I asked this question in a previous survey as well, and the responses this time were a little different. Most of the people who answered my last survey were bloggers (63%), whereas this time it was less than half. I'm not sure what that means or if it means anything, but I figured I'd make note of it in any case. Maybe blogs are dying? Or maybe I'm attracting fewer bloggers these days? Who knows. It makes me happy that there are so many of you who have been reading for a while! I really do feel like I have a great community of bloggers here, and it is always so much fun interacting with you. So hurrah for that. For those of you who are fairly new, welcome! Feel free to email me any time. I'd love for us to be friends. I also have handy tabs up at the top where you can browse some of the archives if you're into that kind of thing. It's not surprising that the majority if you follow me via a blog reader. I asked this question on a previous survey, and since the first time, my Twitter numbers have jumped up considerably (3% vs. 13%). If you don't follow my blog on Facebook, maybe you should. You might have more success getting updates. I always link my posts on Facebook, but I promise not to spam you guys with other links and random crap no one really wants to see. Sometimes I preview upcoming posts too! "Other" responses on this one were mostly that people come directly to the site through my URL. Someone wrote "I manually browse like an animal," so thanks? I guess. I don't know. In case you didn't know, as a blogger it's hard not to gauge the success of a post on the number of comments it did or didn't get. However, obviously that's a terrible way to gauge anything, since it looks like only about 20% of those who read a post consistently leave a comment! This is fine, of course, but it's definitely good to know for my own reference. I also enjoyed seeing that people do read the comments. I find your comments so interesting and fun, and I like that others do as well! Honestly, sometimes the comments section is more interesting than my actual post. Plus you all have great advice. If you haven't ever taken time to skim through the comments, you should! I've been wanting to ask you all this for a long time, and I'll be honest: the answers surprised me. About half of you have no idea what I'm even talking about. If you don't know, Disqus (yeah, I spelled it wrong in the graphic, but I'm not changing it now) is a third-party commenting system that I have been thinking about installing on my blog. A lot of blogs have it. My favorite feature is that when you reply to a comment, the blogger who left the comment gets notified. Currently, only I get notified if a comment is left. I also really enjoy the back-and-forth emails I have with those of you who comment, and I don't really want all of that showing up on my actual post, which is what would happen if I used Disqus. I could email separately through Disqus, but it seems more complicated than just replying to an email, which is what I'm doing now. All that to say, I thought the answers to this would be much more swayed for Disqus, but I was really surprised to see that of the 50% who even knew what I was talking about, nearly 40% don't care either way, and only 8% really want me to get it. Considering that 7% don't want me to install it, it's pretty evenly split overall. I was certain that after seeing the answers to this question, I would install it. But now I'm conflicted. I think I might just leave it as is for now and see how I feel later on. Thoughts? The answers to this question were surprising. I thought for sure you would say that my posts are too long. I feel like compared to many of the blogs I read and see out there, my posts are pretty long. And especially since people don't seem to want to read, I figured more people would say they skim. I am very shocked that not a single person said they think my posts are long. Most if you feel they are just right, so that's great! When I write posts, I don't try to hit a certain word count or anything; I just write until the post feels complete, so it's nice to get validation that I'm doing a good job in that department. I'm pretty surprised that so many people said you wanted me to write about it more. Although a lot of family and real-life friends read my blog, so then again maybe that makes sense. I honestly figured more people would say they would skip anything baby related, but to those of you who said that, I appreciate your honesty! Obviously you are all adults and can skip, skim, or read anything you want. The "other" comments were mainly just saying that they think I should blog about it as much as I want to, and I shouldn't care what anyone says about it. I explained some of my thoughts about blogging about Baby Bum when I shared my pregnancy journal. I know that a lot of bloggers use their blogs as their weekly diary to write about the baby, but since I am making my journal, I don't feel the need to do that. I also don't think I could keep up with a weekly post. I do feel a bit like a hypocrite, because I enjoy reading weekly bump updates from other bloggers I follow (I used to always skip those, but now that I'm pregnant I like reading them), but again I don't feel the need to do them myself, and I feel good about the amount I'm blogging about the baby. However, if anyone ever wants to talk baby or pregnancy with me, I am always up for a good email conversation, so feel free to get in touch that way! Who are you fools who prefer creamy over crunchy? Get out. But really the 6% of you who said you hate peanut butter can leave now. Someone actually made a point to write in a special note to me that said, "Crunchy peanut butter is gross." When I find out who you are, you're dead to me. I am sorry for those of you who are allergic. I keep saying that if Baby Bum decides she's allergic to peanut butter, I'm sending her back. Do they give refunds on babies? I do want to take a minute and give a shoutout to the person who wrote an extended comment about how unfair this question was. I've copied the comment below for your reading enjoyment. Uh, the answer to "My favorite type of peanut butter is:" is not quite fair, b/c it is entirely dependent upon the situation in which it is being used. You made me select one answer! And it was mandatory! See, you cannot have a crunchy peanut butter and honey nut cheerios (optional: banana slices) sandwich. There's just too much going on in each bite, and it is overwhelming. But, you could have crunchy peanut butter and grape (welch's) jelly sandwich. Yes, my house has 2 types (same brand- Skippy) of Peanut Butter in the cupboard - as well as Hellman's Mayonnaise (ick) & Miracle Whip in the Fridge. I'll end it there. Because peanut butter. Part 2 will cover your responses to all the specific topic options, and I want to address some of the critiques I got and responses to "I like reading The Lady Okie Blog because..."
I can't promise I'll get to it soon. We're actually moving next month for real, and it's about to get crazy up in the Bumgarner house. And this was the longest blog post ever, but I liked it! haha Also please don't install disqus. It's a pain in the you know what and it's not even spelled right!!! I like Disqus for the most part (totally spelled it wrong. I can never remember!). I don't feel like it's a pain to comment once you're logged in, but I'm worried about it slowing down my blog like it seems to on some blogs. The responses on that one definitely haven't convinced me to add it! I know I'm in the vast minority, but I am such a fan of long posts. I think that's my inner bookworm coming out. GIVE ME MORE TO READ. This shouldn't be a surprise as some of my posts take half a lifetime to get through. CREAMY PEANUT BUTTER FOR LIFE. Anything chunky gives me anxiety. I too enjoy a good, long post. What really gets me is when someone is blogging away, and then they're like "okay I'm stopping because this is getting long." I'm like... no, actually that's the intro to one of my posts. I think in general people don't read anything, and it annoys me. The worst is at work when I email someone specific instructions in bold and possibly also red font, and they email me back with a question about something I answered in the bold/red font! WHAT. Surveys are so fun! I've enjoyed reading about the responses here...and I'm tempted to run another one myself. I so agree with the person who complained about not getting to choose both types of peanut butter. I believe I voted for creamy, but I like chunky too. If there was a choice "I'm obsessed with pb! Give me chunky, creamy, or any type you can find," I would have clicked it. Seriously, if a person hasn't tried peanut butter on ice cream, pie, chocolate, bananas, cereal, pizza, salad, and soup, they have not yet begun to live (eh, well, you can skip the pb on salad; it really isn't so great). As far as Disqus goes, it's not a big deal as far as I can see. I like blogger comments slightly better because my blogger profile pic is more recent than my disqus one...but hey, that's something I could easily change. ;) Either way is great. Yes, it's if there were :) Good job on that one! Not many people know that rule. Ha! I loved reading the answers!!! I do not like disqus, but clearly I am the only one!!!!! Also, interesting to see how many of your blog readers do not have a blog!!! PS ALMOND butter on the way!!!!!!!!!!!!!!!!! This is so fun to read! I must say I was disappointed in the disqus answer (I voted yes haha). I would say the biggest drawback is the whole conversation showing up in the thread on your page which is annoying... BUT when I comment from my phone (which is most of the time), if I screw up once I have to start again. You're worth starting my comment again but some people aren't and I won't leave a comment for that reason. That's the main reason I voted for it because if I mess up in disqus it's no problem to go back and fix my mistake. On the regular comments don't you have to sign in? Or now that I looked you can just leave as anonymous? I remember when I had just the default blogging system my brother told me he wanted to comment but didn't want to have to put in his email so I thought by switching to Disqus, where you can comment as a guest, would make it easier? Maybe I'm confused. Thanks for making the effort for me :) That's so nice of you! I was honestly really surprised because I figured the responses would be swayed for Disqus, but everything turned out basically even, so now I'm just at the same place I was before. It really is crazy to see how many people don't leave a comment. I think it puts it all in perspective that comments aren't everything. What gets me are the people who never leave a comment but read the comments. Moochers! What a thoughtful comment on peanut butter! I actually voted for crunchy, but that was pretty convincing. I mean cheerios AND crunchy? It really might be too much. I'm also heavily debating adding Disqus. The only thing is that most of my commenters are using the Blogger form on their own blogs, so maybe I'll lose them and have to find new friends. I like the aspect of other people being able to have conversations, but I don't like losing the privacy of a one-on-one conversation with the blogger. And it would definitely make it more difficult for family/friends/non bloggers (if they even comment in the first place). I actually found some code to install multiple commenting systems, and I tried to get that to work. I couldn't get it, but I think maybe that was a good thing because a lot of people said it really slowed down their blogs. I'll be interested to see what you end up doing! I think I'll just leave my comments as is for now. I really did think the responses on that one would sway me toward Disqus, so that surprised me that it wasn't all that much different! I agree that losing the privacy of a personal conversation would be annoying. Like, it says I got 30 comments, but 15 of them were a back-and-forth? That's just unnecessary. am I really dead to you? it was nice knowing you :( crunchy peanut butter is gross though. it's cool. I dig it. actually, i might be sobbing uncontrollably. but it's cool. dead people don't cry. Ok, I am a fan of crunchy. It's the only way to go. I'm NOT a fan of Disqus at all. I comment SO MUCH LESS on blogs with Disqus. If a blog has Disqus, I tend to only comment if I feel it's absolutely necessary. So if you install Disqus, I'm going to assume you're only doing it so I'll comment less. I'm kidding. Kinda. I love numbers and data and dorky stuff like that so this was super interesting to me. I feel the same way about Disqus. I'm way too partial to my email chains and like having those conversations privately rather than publicly. I like blogging for the relationships, not necessarily for gettif a billion comments, and I feel like I've been able to form those relationships because of said email chains. I know people who have it love it but I just don't think it's for me. CREAMY FOREVERRRR! :) I love numbers and data and long blog posts so I enjoyed reading this too! I'm with Tracy and like my email chains of conversations because I usually don't respond after one comment on Disqus but I'll go back and forth via email. The results are very interesting to read. And this creamy peanut butter business kinda lost me. How can ANYONE prefer creamy over crunchy? Question - Why do the pie charts take so long? Do you create them in Photoshop? What if you created them in PowerPoint and then just turned it into an image? They are super interesting to see. Disqus - I say you just keep doing what you want! I'm actually thinking about taking it down but I have to wait until Thailand because the internet isn't good enough to do that here. ha! Also, it often takes FOREVER to load in Myanmar! If I had it where I could respond in an e-mail I could just hit reply and then e-mail from my phone in my apartment. The pie charts themselves don't take all that long, but getting all the colors and the font and the whole graphic does... Plus writing out my thoughts to go with each response. The post takes a long time to put together! PS, I haven't noticed Disqus being slow in a long time. I really like it because people tend to have more conversations through it. I'm pretty happy I switched over on that one! I'm one of the really really anti-Disqus people. It loads insanely slow for me, I often have to refresh a couple times to get it to work. That is most likely due to my location in the world, though...China isn't exactly known for its amazing internet speed. And I detest any and all peanut butter and any food that contains peanut butter. I'm blaming this on my mom because she was told as a new mom that it's dangerous to give young kids peanut butter so none of us even tasted peanut butter till we were like 10. I didn't grow up with it. Happy packing everything you own and moving! We've got like 12 days till our move but it'll be fairly easy since we have like nothing to move, hurray! I am not a fan of disqus. I put up with it but hate having to log in - it's not that big a deal on my laptop because I stay logged in but on my phone (where I read about 1/2 of my blogs) it's THE WORST. I much prefer commentluv to disqus. But loved reading all this so thanks for sharing the results of your survey! I was on the fence about Disqus for a looong time, and actually installed and uninstalled it twice before finally committing. But now I really like it! It hasn't slowed down my blog at all as far as I noticed, and I do like that I can answer on the blog and the commenter gets it via email. But at the end of the day I don't think it matters much either way! If you're happy with what you have, just keep it. Also, I'm in the creamy peanut butter camp - with jam on warm toast it's like a soft hug in the morning. If I want something rough I can hug my husband, his stubble in the mornings is fierce! I find this so interesting! I am definitely someone who leaves comments on every post I read, but I seldom read the other comments. Unless of course I find the post controversial and I'm curious about other peoples' responses. Or if a question is posed in the post that I am also curious about. But other than that, I don't often read the other comments. I should, though! “Your obsession with peanut butter is concerning.” Seriously, I think you make me laugh out loud at least once a blog post. And now, I’m mad at you because you made me say laugh out loud. Maybe I should have said giggle audibly??? I’ll work on it. My husband doesn't like peanut butter. He is WEIRD, I know. But I didn't find this out until we'd been together like six months already, and I was already in love with him, and we were discussing marriage, and he'd even gotten a passport to visit me since I was moving to Canada at the time. I was too invested to leave him over what is apparently NOT a "non-negotiable" for me. I did make sure he had read all the Harry Potter books before I agreed to go on a first date with him. that really was a non-negotiable.